Five days is a great amount of time in Barcelona. You’ll get around to all the highlights, have plenty of time to eat and drink your way through the city. You can lounge in a park or on the Barceloneta sand, catch plenty of rays and learn how to live like a Catalan. If you really squeeze it all in you just may have time for a day trip too. With 5 days you can choose your neighborhood to stay in without any constraints. Ciutat Vella or Eixample are great, central neighborhoods giving you ease of access to all the hotspots of Barcelona. If you’re in town in the summer and plan to spend a lot of time on the beach look at staying in the Sant Marti area and get all the rays you need. El Born is also an excellent choice for something a bit less touristy but still central. For a mid-range stay try K+K Hotel Picasso in the Born neighborhood. Or for something more upscale look at Hotel DO Placa Reial in the Gothic Quarter. The stunning Mercat del Born has ancient excavations inside. It would not be possible to visit Barcelona without experiencing some of Gaudi’s finest works. Most well-known and the most difficult to avoid, the Sagrada Familia towers over the city. The grand structure, always intended to be a church, but the size of a cathedral is proposed to be finished in the next 10 years. However, its designs show 18 spires while only 10 have been built. Regardless of its incompleteness, the church is undeniably breathtaking. Both in and out it’s worth all the time you can give it. Buy a simple entrance ticket or supplement it with an audio guide or an in-person guide. It’s also possible to access the towers (they are worth it) for a view of the city and the building itself. Be sure to book ahead of time to avoid long wait times. And with 5 days you could have the luxury of choosing the right time slot. Not far from the Sagrada Familia is Parc Guell, a great example of how Gaudi integrated nature into his design work. The park was originally residential, designed for the upper class to have homes with all the latest technology. Today the public can access the park. While some areas are open the most impressive parts, full of Gaudi’s mosaic sculptures, are ticketed. Purchase your ticket online and choose the time you’d like to enter. Stay as long as you like. Enjoy the view. Savor Barcelona. The Gothic Quarter is a great neighborhood, it has a lot of interesting historical buildings but it has also become increasingly geared toward tourists. The nearby neighborhood of El Born, once home to jousts, now boasts nightlife, culture, and history. Shop, drink mojitos, eat pizza, go to the Picasso museum or sip a coffee in a café. One of the trendiest, most happening neighborhoods in the city, El Born is a treat. While navigating your way through both neighborhoods do so only with your nose, pocket the map, power off the phone and just get lost. Mas que un club. FC Barcelona, the football team that stands for more than that. A symbol of Catalonia itself a game is not to be missed. Camp Nou, the stadium where FC Barcelona plays, can be toured during off hours but if you can manage to grab yourself a ticket, do that instead. The energy in the stadium is intoxicating! Tickets can be purchased online and start around €50. Spain is home to tapas, and throughout the country the specifics of tapa culture vary. You may also sometimes here tapas referred to as pinchos, the word originates from the Basque region where it’s written pintxos. Pinchos are almost always on top of a small slice of baguette. Whatever they are called tapas are a great way of eating. The best thing to do it make your way from bar to bar having one or two tapas with a drink and moving onto the next one. Don’t expect to sit, in fact, the more pushing and yelling you have to do to place your order the better the place probably is. Go to Can Eusebio for a great, authentic experience. Try bombas, a croquette native to Barcelona named for the bombs thrown throughout the cities during the Spanish Civil War. Of course, you should visit La Boqueria food market, but with 5 days you can go more local and visit Santa Caterina food market close to Barcelona Cathedral. Try cava, produced throughout Catalonia, the region Barcelona sits in, cava is a sparkling wine. If you’re in El Born go to El Xampanyet an order a glass. Vermouth, another typical Spanish drink is to be sipped over ice with an orange wedge, before dinner. It’s got a slight sweetness to it but goes down easy! Try it at Bormuth in El Born or read this list for some other great places. If you’re after sangria be careful, many places that sell it are tourist traps and charge a lot for a water downed version. Order tinto de verano instead, it’s what Spaniards drink in the summer. Cheap red wine mixed with lemonade, you might be thinking it’s a sin, but try it and then decide. For the art lovers, Museu Picasso is an excellent way to spend an afternoon. Home to over 4,000 pieces done by Pablo Picasso it is one of the most extensive collections in the world. The museum was not only the first one dedicated to the artist but it was also amazingly, the only one created during his lifetime. The buildings that make up the museum create the perfect atmosphere for the extraordinary artwork. Five medieval palaces join together to create Museu Picasso. Daily admission has a cap so be sure to book ahead of time. €11 gets you access to the permanent exhibits or €14 with temporary. Barcelona has many museums to choose from if you are not a Picasso fan. Barcelona is full of shopping options (don't miss the souvenirs), as one of Spain’s trendiest cities, you’ll find an array of designer names, chic boutiques, and chain stores. For a great mix head to Passeig De Gracia which is full of shops like Zara, H&M, Pull & Bear as well as the higher end shopping like Louis Vuitton and Chanel. The street runs through central Barcelona you so you can stop by as you’re doing your sight-seeing or make a special trip just to refresh your closet. And be sure to browse the lanes for souvenirs. If you feel like you’ve seen all that Barcelona has to offer (though this seems impossible with a lifetime to try) or if you simply need a little break from the big city hop on over to Girona for a day. If you rent a car you can get to Girona in about 90 minutes but the new highspeed train will get you there in 37. 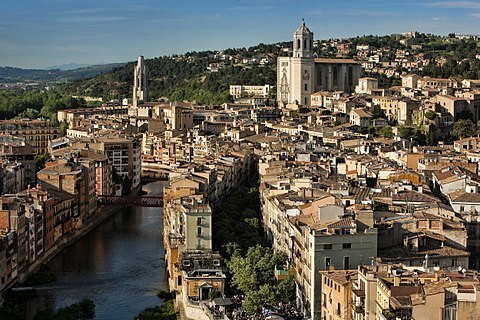 Girona is the perfect example of a traditional, prosperous, independent-minded Catalan city. Girona, a much smaller city than Barcelona is a wonderful medieval mystery. Weave your way through its tangle of streets, go to museums and galleries, experience the churches dotted throughout. Experience the bits of Jewish heritage still trickled throughout. Girona is certainly worth the trip. Montserrat and Sitges are equally popular options for a day trip.